On 22 December 1941, the Japanese 14th Army under Lieutenant General Masaharu Homma landed at Lingayen Gulf on the north east coast of Luzon Island, the largest island in the Philippines. The Japanese forced the Americans and Filipino forces to retreat to the Bataan peninsula where they were besieged for nearly four months before a renewed Japanese offensive forced a surrender on 9 April 1942. On 20 October 1944, the United States commenced the liberation of the Philippines with the landing of troops on the island of Leyte. The invasion of Leyte saw the first use of kamikaze attacks with one damaging HMAS Australia. The Japanese Navy mobilized most of its remaining major naval vessels for the largest naval battle of the Second World War, the Battle of Leyte Gulf. The Japanese navy suffered a decisive defeat. Among the Australian ships in the battle were the cruiser HMAS Shropshire and the destroyer HMAS Arunta. The next American objective was Luzon with the US 6th Army landing in Lingayen Gulf in the same area where three years before the Japanese landed. The Bombardment and Fire Support Group included four Australian ships, cruisers Australia and Shropshire and destroyers Arunta and Warramunga. Between 6 January and 9 January the day of the landing, HMAS Australia was hit five times by kamikazes and that afternoon was ordered home for repairs. One of the three Australian landing ships at Lingayen Gulf, HMAS Westralia had a narrow brush with a kamikaze. By March the Americans controlled all strategically and economically important locations of Luzon, but small groups of Japanese held out in the mountains until Japan’s surrender in August. 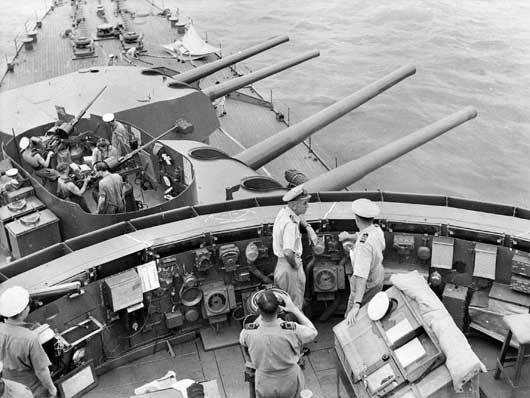 The forward 8-inch turrets of HMAS Australia seeking out the enemy in the South West Pacific Area (AWM 017623). 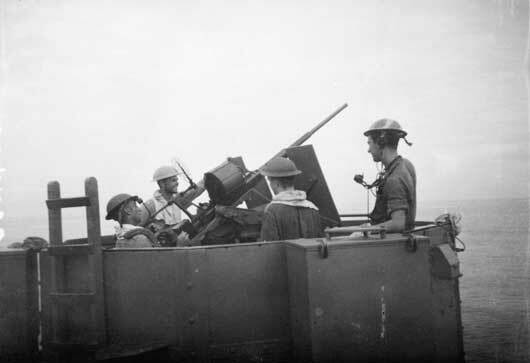 A 20mm Oerlikon AA gun crew on an Australian Corvette goes into action off Leyte Island (AWM 017970). 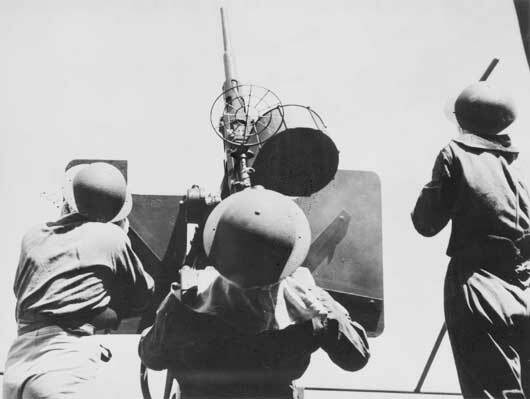 An Oerlikon gun crew on board HMAS Kanimbla preparing to fire on enemy aircraft in Lingayen Gulf (AWM 134255). 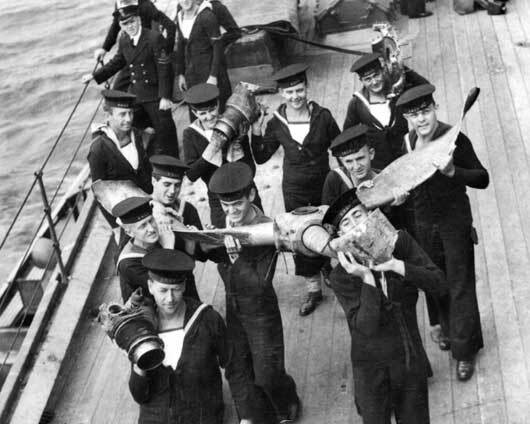 Ratings of HMAS Australia carrying a propeller from a Japanese Kamikaze plane (AWM 306770). 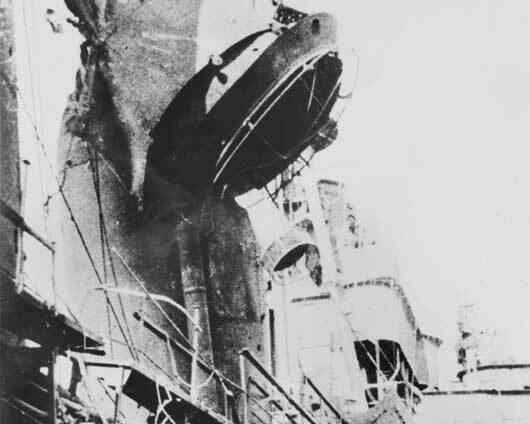 Close up view of damage to the fore funnel of HMAS Australia caused by a Japanese Kamikaze attack during the Battle of Lingayen Gulf (AWM P02018.345). 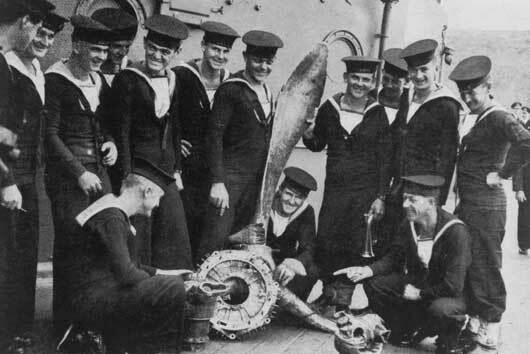 Some of the crew of HMAS Australia examining the propeller of a Japanese Kamikaze plane, which crashed into the ship during the Battle of Lingayen Gulf (AWM P02018.346).